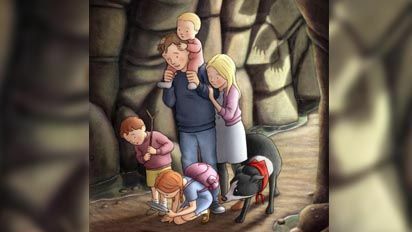 Produced by the makers of the hugely-popular The Snowman and The Snowdog animation, We’re Going on a Bear Hunt follows the intrepid adventures of siblings Stan, Katie, Rosie, Max, the baby and Rufus the dog, who decide one day to go on an adventure in search of bears. The half hour film will expand the universe of the much-loved book for a truly festive family treat. Olivia Colman (Broadchurch, The Night Manager), Pam Ferris (Matilda, Call the Midwife) and Mark Williams (Harry Potter, Father Brown) will breathe life into the brand new characters of Mum, Grandma and Dad respectively. 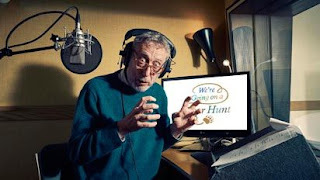 Michael Rosen, who wrote the best-selling book, will play the Bear, plus a few other voice characters! Acclaimed British singer-songwriter George Ezra has written and recorded the theme song. The 23-year-old, whose debut album Wanted On Voyage was one of the UK’s best-selling of 2014, has penned a distinctive, sweet song called Me & You for the film’s soundtrack. The collaboration marks the first time that George has composed a bespoke song for film or television. Here's a couple of interviews that Channel 4 did with the author Michael Rosen and illustrator Helen Oxenbury. Author Michael Rosen talked to Channel 4 about the origins of his much-loved classic book, the many hours of research involved in voicing some key roles in the forthcoming animation and reveals what he really, really wants for Christmas this year. And how to make the perfect Christmas pud. When did you first write We’re Going on a Bear Hunt? I first started working on Bear Hunt in the mid 1980’s. I’d heard it as an American summer camp song. So I started performing it and as I was performing it, I was adapting it as I went round schools. So I would say around about 1983/1984 was when I really got hold of it. What intrigued you about it? The thing that really caught me about We’re Going On A Bear Hunt is the repetition and, how, if you do it with young children they learn it as they go along. So even in a first performance you just start with ‘We’re going on a bear hunt, we’re going to catch a big one’ however you do it, by about the third verse they know it. That’s very infectious. Anyone who performs wants things to be infectious, particularly with children. What do you like about writing children’s literature? I don’t really know why I like writing children’s books, it happened sort of by mistake. I was writing about my childhood, in what I thought were poems and stories for adults. It turned out that children liked them and adults didn’t to start off with! So I accepted the offer from publishers to write these sorts of things and then I found that the moment the books came out, schools and libraries were inviting me in, and I suddenly thought, this is a very nice audience. I can improvise, I can make up things - I can make up things on the spot and no one’s objecting! No one’s saying “hang on a minute, it says here you should be saying this…”, so that was lovely and it really just flowed from there. Then I started having children and trying to entertain them as well and some of the ideas came out of that too. What are the challenges for writing for children? It’s not directly and immediately easy to write for children because you do have to think about the certain extent in the mind of a child. As we were all once children, one of the ways you can do this is to think back to the kind of child you were and what you liked. Another way is to closely observe the children around you. That can be your own children if you’re a parent or grandparent, or it can be children you’re teaching, and you think about what it is that’s engaging them and what sorts of things they really like and you go, “Oh I could write that”. The other thing is, as you are around children, you get ideas for things. They say something and then you’ll think that would be interesting. For example, you hear about a child who’s lost a dog and you look at the child and you think about what that child is going through. Then you think I could write a story where a dog has got lost – how could I write that? I know! I could write it from the dog’s point of view – I’m a dog and I ran away… And suddenly you have a children’s story. 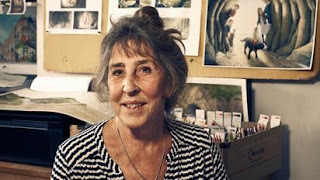 What was it like teaming up with illustrator Helen Oxenbury? Teaming up with Helen Oxenbury was just quite extraordinary. I’d performed We’re Going On A Bear Hunt and I was asked by the editor at Walker Books to put it down on paper. I did and he took that away. Then I don’t think I heard from Walker Books for about two years. Then I was asked in and Helen had done these huge paintings and I remember looking at them thinking but that’s extraordinary! They had nothing to do with the kind of raucous occasions that I’d been performing the poem in nursery schools for Year One and Year Two, suddenly there was this huge world, a place - the place is so vivid. The English countryside and these characters and the dog and the baby and I thought where did they come from, that’s all come from Helen! It was like a huge mountain she built on what was really just a tiny little bit of paper. So I was amazed, absolutely amazed. Why do you think this book has been such a success? I think the book is a success for various reasons. One is because it’s got this pounding rhythm and repetition, but I think the main reason is because it tells the story of a family, or a group of people who seem related, and they are having tough times - and we all have tough times. It doesn’t say “Here are a family having tough times”, it’s kind of making fun of it. It’s a thing people say - “Oh no! We’ve got to go through it!” The reason why we like poems, stories and films, and so on, is because they represent something that we do in our lives without being exactly the same. It’s sort of funny but not, it’s intriguing and you keep thinking as you read it and see it more and more, “Why they are doing this? Is it a real bear? Or is it a bear in their imagination?” For a two year old it is a real bear in one sense. Of course books aren’t real because there’s no bear in the room, but it’s as real as it gets. As you’re older you start thinking “What is it about?” and there is no answer! Children say to me: “What’s the Bear thinking on the last page in the book?” and I tell them I don’t know and ask what they think. Everybody’s answer to that question is legitimate, every answer is the right answer. What is it like having your classic book turned into an animation? We’re Going On A Bear Hunt being turned into animation is just extraordinary. It is animated in my mind anyway. It’s animated because of the way I perform it. It’s animated because, when you move the pages it does sort of move anyway, but those are stills obviously. So to see the film is amazing and to think of a new story hanging around the classic story as well, with all sorts of other emotions swimming along, that feels amazing! There’s a kind of simultaneous “prequel-sequel” thing going on. It’s like Star Wars really, George Lucas started on number four didn’t he? This is a bit like that, the book is number four and this animation is number three and number five. So – it is utterly amazing! From what you’ve seen so far, is it true to the book or is the animation taking it somewhere different? I think it’s always wrong to want an adaptation to be a strict adaptation. I know that’s mad but the point is, a book is a book, a film is a film, a radio programme is a radio programme. It is a new creation and so you have to go with the new rhythm and idea. Animation does very special things, it can create things that aren’t real and make you think they’re real in a very moving way. Just think of Raymond Briggs’ The Snowman. In real life children don’t meet a bear and have a chat with the bear, it just doesn’t happen. You just look over the fence at Whipsnade Zoo and go “Wow! Look at them!” and that’s it. You don’t go near bears. This story is very powerful stuff, this is like Greek myth. In Greek myths people meet great big beasts - think of Theseus and the Minotaur - and you believe it. There isn’t such thing as a Minotaur. It’s the same here - the children meet a bear and the bear has emotions and the children have emotions. The point is you see it in their body shapes and the sounds they make and that is beautiful. This is at the heart of all art - you get emotion from the shape. I’m very moved by it. What part are you playing in the animation? I play the Hedgehog, and I also play a not insignificant role - the Bear! This film stars Michael Rosen as the Bear - you can’t imagine how thrilled I am! I’m trying to keep a straight face but I’m actually crying and laughing at the same time. The idea that I can be the Bear in the Bear Hunt - it is mind blowing. What’s it like being a hedgehog? Being a hedgehog is one of the hardest roles I’ve ever played. I once played Horatio in Hamlet, I once played Sir Toby Belch, I once played a little bit of Bottom in Midsummer Night’s Dream but the Hedgehog, I think, caps it all. It’s up there, it requires serious ‘sniff acting’. I did study Stanislavsky’s method acting at one point. I thought about the Hedgehog’s mother, the Hedgehog’s father, where the hedgehog had been, where the hedgehog goes shopping… If those people in the recording studio thought I could just turn up and go “SNIFF!” without the method work…No! What has your involvement been so far in the making of this animation? With the animation, I was invited to come in and look at the draft script. I had one or two ideas which, if they’d been sensible, they would have ignored. They seem to have taken on board one or two and very thoughtfully and carefully did ignore others which is brilliant. It was wonderful to have conversations with all the people at Lupus Films, to talk about this and that and what’s possible. I’m a great fan of animated films anyway, it wasn’t as though I was coming into a strange world. This is something that I really care about and think is a serious art form. It was just wonderful to chip in and join in discussion. Also having a starring role in the film as well, I think that’s my major contribution to the whole project. Have you done voice recording for animation before? I’ve done a little bit of voice recording; it was for something very serious. It was a film for children to talk about bereavement and it was an animation. Because I’m a bereaved parent it was appropriate for me to do the commentary. It can be very challenging, because you’ve got to hit numbers. You see something come up on the screen and at number 23 you’ve got to come in and say “And on the other hand…” But here they let me be a bit looser with the Bear and the Hedgehog; I didn’t have to hit number 23. I think my favourite part of the story is when they’re on the water’s edge, in the mud. There’s something about that mournful north European landscape and curlews overhead. In my experience, I know the river Wade and estuary there, and Cornwall, and if you pad about, your pace of thinking changes. That’s what happened in the film, the pace changes, so as they’re hanging about you start thinking about other things. You wonder why you’re there, you kind of – a word my dad used to use - you boodle about. You’re not doing stuff in a directed way, it’s lovely. Children need that time, quite often we’re hurrying from place to place with children, we’re hurrying them to school and back. To see a little bit of the film where people are just boodling and wonder what they’re doing. That older boy he has such big responsibilities hasn’t he? You kind of hear that and I think the mud reflects that. The final film will be shown on Channel 4 this Christmas. How will you be spending Christmas? Do you have a typical Christmas routine or annual traditions? We do have a general tradition, it’s just quite ordinary! We have a whopping great big turkey and all the trimmings and all the veg, and I get a bit nutty about Christmas pudding. It means a lot to me, I don’t know why. It’s probably Mum, the Christmas pudding is Mum at that moment. If either I haven’t got any, or if it’s not hot or not cold, or it hasn’t got the right custard I get bit “Oh. This is not right.” It’s quite absurd really. You can have it all year round anyway, it’s only a steamed fruit pudding, isn’t it?! Are you a fan of Christmas? I am a fan of Christmas, the sheer joy of it. Obviously it does get a bit excessive, and it can get a bit sad to see a child rush through their presents and go: “Are there anymore?” It feels a bit sad particularly if they’re upset if an older brother or younger sister has got more. You have to do quite a lot managing as a parent so that it’s immense fun but doesn’t get vengeful. I enjoy myself, people give me lovely things. I love giving things, that’s really nice. Who knows I might get a tie one year. What a thrill to have a tie - I haven’t worn a tie for about 49 years. So imagine that - a tie! Helen, who illustrated the book, talks to Channel 4 about the original inspiration for the kids - her own children - and reveals the locations that inspired the stunning British landscapes. You illustrated the iconic children’s book, We’re Going on a Bear Hunt, in 1989. How did you come to work on it? Well, I was shown the text by an editor, who asked me what I thought of it. And I thought “My God, I know it!” Because before that, someone called Alison McMorland came to see me and asked me to design a record sleeve for her collection of songs. One of the songs was called We’re Going on a Bear Hunt, and she sang it with her son. So it was a song before it was a book? Oh yes, it was a sort of folk song, especially in America – they used to sing it around the campfire. So I knew it well. That’s right, yes. My editor heard him reciting it to a class of children, and he said to him “Now look, Michael, you’ve got to write that down.” I get the impression Michael didn’t really want to, but in the end my editor bullied him, and he wrote it down. And that was his version. So you were just sent the end product and left to get on with it? That’s right. I couldn’t bear to have an author standing over me saying “No, I don’t see it like that.” I got the text, I said yes, and after that, you have to feel that, because they’ve asked you, they want you to do it, and think you will do it well. So I just got on with it, and thoroughly enjoyed it. I’ll tell you what was so good about it – when you read the words, nothing is described. So it gives an illustrator a completely free hand to choose the characters they want, and the landscapes they want, and it’s lovely to have that freedom. So you basically created the characters? Were they based on anyone? Oh absolutely. I think they were based on my kids. I couldn’t help but be influenced by them. The boy that everybody thinks is the father was my son, because there was quite a big gap between him and my youngest child. It was actually kids going off on an adventure without any adults. But a lot of people see him as the father, and the eldest girl as the mother! But that’s not how I imagined it. And the locations were places you were familiar with? Oh yes! I was brought up on the east coast, by an estuary, and when the tide goes out there are all these mud flats and wonderful great skies in East Anglia. So that was the mud scene. The forest was Hampstead Heath, which I know very well. The river I just made up. The field was near a little place we had in Dorset. And the beach with the cave came from when we used to have holidays in Wales. There was the most beautiful beach, and it did have rocks and caves and things, so that was my inspiration for that. Even the dog was my dog. It was lovely, I could do all of that without worrying that I wasn’t keeping to the text. Did you ever have any inkling of what a success the book would become? No, not at all. I find it amazing. One never knows what’s going to be a success and what isn’t. Lots of things I think should be just aren’t, and sometimes the other way around. Why do you think it struck such a chord with readers? I can only answer that from what people have told me. People are going back to letting their children have freedom, getting out with nature. I think there’s a feeling that children don’t get enough freedom, I suppose, and any stories that have that element seem to go down well. It’s all illustrated in watercolours. Do you always work with watercolours? No, not always. It really depends on the story. I think watercolors are lovely for English landscape. You don’t want hard, bright colours, that’s not what it’s about. I have done stories using gouache, because the stories and the characters suggested it should be much more strong and colourful. I did a book called So Much, about a British black family, and the colours that they wear would just be hopeless in watercolour. Did you have reservations about this book being turned into an animation? It’s very dear to so many people, I’m sure it is to you. I would have been worried about it, but I know that Lupus Films are so good. They did The Snowman, and other Raymond Briggs things. They are very, very good, so I wasn’t as worried as I would have been if it was someone I didn’t have that respect for. How much input did you have into proceedings? They’ve been marvellous. They’ve asked me in several times – I even went to Abbey Road the other day, to listen to the orchestra recording the background music. That was wonderful. And I met George Ezra, who’s written and recorded the theme song. Was it important to you that the animation for the film still featured elements of watercolour? Absolutely. And they’ve been marvellous in the way they’ve really tried to keep that feel in the film. I mean, obviously they’ve had to pad it out, because otherwise the whole thing would be over in five minutes. But it’s all dotted with bits of film that you recognise from the book, which is jolly nice. And they’ve really done it beautifully. For instance, the snowstorm, they’ve really got the atmosphere and the sparseness and the bleakness of it beautifully. They haven’t tried to pretty it up or anything like that. I have great respect for what they’ve done. At the end of the book, the bear looks rather forlorn. Why did you decide to do that? Well, when I got to the end of the book, I thought “That poor old bear!” The kids are all safe and back home and everything, and really, what was this bear up to? So on the end pages I thought I’d carry on the story a little bit, and give the impression that perhaps he was a pretty lonely old bear, really. I just wanted to show his story a little bit. And they’ve sort of carried that over into the film, haven’t they? Yes, and I thought they did that very well. I’m glad they’ve done that. It adds a bit of pathos. Children actually quite like a bit of pathos in their books, don’t they? I think everybody responds well to pathos, whether you’re a kid or an adult. We don’t want bland things. As an adult, you want to cry or laugh or get scared or something, and kids are no different. What do you make of the film, from what you’ve seen? I’m terribly impressed. I’m delighted. It’s been absolutely true to the spirit of the original, as much as they possibly can. It’s a half-hour film, and they’ve had to pad it out, but they’ve kept the spirit of adventure beautifully. We’re Going On A Bear Hunt will be on Channel 4 this Christmas.